I'd like to make a Parlor w/ brass tailpiece. My question is regarding the bracing. Would I use a Transverse brace here? You could use either transverse or X bracing (I use X bracing on octave mandolins with tail pieces) The force will be pressing the bridge down into the soundboard more than "pulling" on the bridge, so you may want to arch the soundboard more and adjust the neck angle some to give enough down bearing on the bridge. Without the "down bearing" you don't get a good transmission of the vibration of the strings to the soundboard, but because of the down bearing" you need to make the soundboard stronger. It makes for a different sound. The trick is to get the down bearing right to give a reasonably loud instrument with good sustain. Adjusting the tail piece up and down will change the down bearing and help you do this, as does adjusting the angle of the neck. Many Parlors had tailpieces added to help them deal with steel strings - which they weren't designed for. The results were marginal at best. You may want to study and adapt some of the features of the Selmer -Maccaferri guitars. You can make a tailpiece for purely cosmetic reasons by creating some kind of pinless bridge where rather than the string ends anchored in a recess at the bridge they are anchored on the tailpiece. But if you are talking having a float top with a tailpiece and floating bridge you are talking about a totally different animal. I would recommend looking at flat top mandolins and mandocellos. Also, Selmer guitars of the early 20th century. You will likely need a conical dome or a pliage to resist the down force. Of course, all of that will affect dramatically the tone. Not surprisingly you will probably end up with something that sounds like a Selmer. Instruments with tail pieces - archtops, bowed instruments, resonators, mandolin family, Sel-Macs - tend to have a component of string tension (and thus vibration ) perpendicular to the top - that is the strings drive the top up and down. For that reason simple bracing patterns - ladder braced or the tone bars - make sense, you don't need to counter rotational forces. Pinned bridge have a high percentage of rotational torque at the bridge. The strings are anchored to the top right behind the saddle, Torque pulls up on the lower bout and forces the area between the bridge and sound hole down. The string vibrations rocks the top around the bridge axis. That is why X bracing makes so much sense - the stiffest part of the bracing structure is right where the stress is highest. X bracing will certainly work for a guitar with a tailpiece (Roger Siminoff refers to them as "floating bridge instruments" even tho many have the bridge glued to the top) but it might not be the best design. When I was building a ladder braced smaller bodied 12 string I asked Todd Cambio the difference between a tailpiece and pinned bridge on this style instrument (he builds both). He said that he hears a little more complexity in the pinned bridge, that the tailpiece tends to be a little more fundimental and bluesy. Keep the break angle over the bridge as low as possible. It's a little hard to say how much you need: six degrees is probably a bare minimum, and a little more won't hurt. So long as the strings stay in contact with the bridge top all through their vibration cycle, and don't roll sideways when plucked, they're going to work fine. 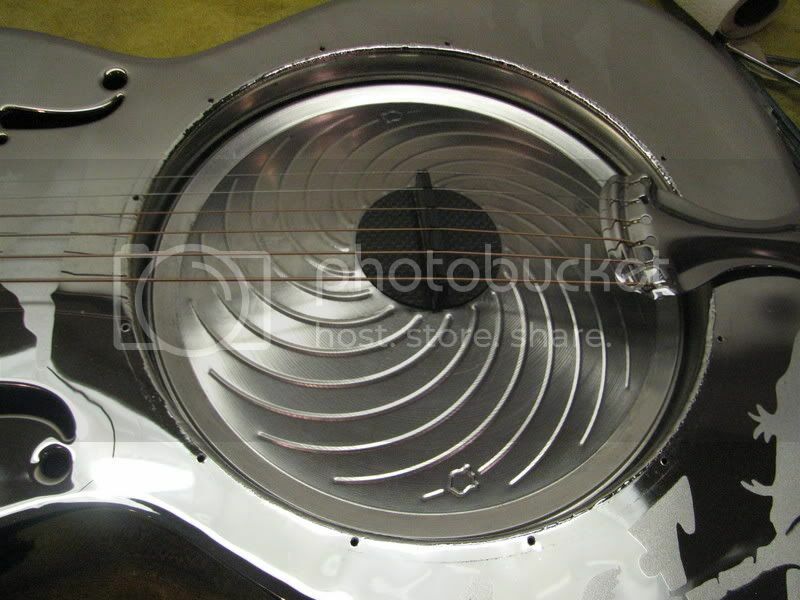 I actually did an experiment years ago with an arch top that used a 'hook' tailpiece. These setups, with an 'L' shaped tailipiece that hooks over the edge of the body can have the pivot point below the level of the edge. Since the strings as they come off the top of the bridge point toward the pivot they can actually, in effect, go 'through' the top, giving a much higher break angle. It is often said that increasing the break angle makes the guitar louder, supposedly due to increased sound transmission to the top or something like that. In fact, I got no change in loudness until the break angle reached a certain point, and then the tone just died, rather than becoming louder. Since then I've stuck with minimal break angles. More doesn't help, and can hurt. I'm with Alan on break angle, just enough to keep the strings on bridge. More is simply pre-load on the top, and I can't figure out why pre-loading the top with 40 or 50 lbs of downforce is a good thing, yet people (players more than luthiers) keep coming up with "string break angle increases the coupling of the strings to the top". I did an experiment where I built a guitar that ended up with 22 degrees of string break angle with it's first iteration. Sounded muffled and dead. I did the math and it had 55 lbs of downforce on the top. I reduced the break angle to 12 degrees with a different tailpiece design, and it opened up a lot. A good tailpiece for a parlor guitar would be one from a Dobro, they are actually parlor sized anyway. Too much is too much, and not enough is not enough - a few degrees difference can make a big difference in the sound and output of the instrument. Parlors that were converted to tailpiece guitars often didn't have enough to drive the top and keep the strings from "bouncing" off the saddle. If the strings don't remain in contact with the saddle they don't transmit the vibrations to the top. If you blindly slap a tailpiece on a traditional flat top parlor design you might wind up with the same problems. My reasoning (perhaps faulty) is that the break angle over the saddle ought to be roughly the same as the break angle over the nut - that is, somewhere in the 12-15 degree range - for pretty much the same reason. You need enough pressure to cut off the string's vibration at the forward edge of the nut/saddle, and no more. I used a minimum six degree break angle in my experiment to see what effect, if any, the angle had on the sound. I was using a mechanical setup that pulled the string 'up' directly away from the soundboard and then released it, so it started out vibrating purely 'vertically' relative to the top of the guitar. I knew that the greatest angle the rig would get relative to the resting position of the string was no more than six degrees, so the string would not be lifted off the saddle top by the pluck. Since the amplitude of the string only decreases as it vibrates, it would never exceed that. This was an artificial situation, of course. Normally when you pluck a string it also gets pushed sideways, which causes it to roll across the saddle top if it can. More down bearing angle helps to 'nail' the string in place and keep that from becoming a problem. Lest this seem academic, I have seen a paper which showed that strings can actually produce sound at two slightly different pitches when they vibrate with both 'vertical' and 'horizontal' components of motion. The author noted that the difference he was seeing would be the result of about 1mm of string length difference, which could be caused by the strings rolling on the fret tops. At any rate, in practice 12 degrees of break angle seems to be sufficient in most cases for a smooth saddle top. With notches you don't need much break angle at all. The first is a ladder braced 12 string, top has a 20 or so inch dome, neck angle is a degree or so to make the fret plane hit the top of the bridge, total height of the bridge and saddle over the top is about 1/2 inch. The tailpiece is at the end of the guitar and is fairly close to the top. The angle between the string segments is about 174 degrees, is this a 6 degree break angle? The red guitar is a flat top but its sort of built like an archtop. Top is domed about 20 inches, floating bridge, neck is angled slightly so the fret plane hits the top of the bridge at its lowest position. The strings are 7/8 over the top at the bridge. I measure the included angle at 169 degrees, does that mean the break is 11? The yellow guitar is a Gibson ES style - laminated top with a considerable arch. Neck angle is 3 or 4 degrees and it overstands the body. Floating ToM bridge adjusted so that the fret plane hits the top at the lowest adjustment. I measure 167 between the string segments - would that be 13 degrees? All three guitars have notches in their saddles to space the strings. If I make a bunch of simplifying assumptions I can calculate the downforce on the top of the guitar - with 250 pounds of string tension the 12 string has maybe 25 pounds vertically into the top, with 170 on the yellow guitar I calculate close to 40 (I'm simply reducing everything to right triangles and applying a little high school trig). If I change that 12 string to a sixer with 165 pounds of tension the vertical component is in the 17 pound range. The only other thing I can add is that all three guitars play beautifully and seem to be holding up well. Since I didn't have a clue what I was doing when I built them I'll put that down to blind stupid luck. I did find this vector diagram in a discussion somewhere and they defined the break angle as theta (the upper angle next to the "b"). That makes some sense but is certainly not in the 6 to 13 degree range that you folks are talking about. Phi is more reasonable but it would be tremendously affected by the shape of the top (show flat here but most certainly domed or arched on a real instrument). Also this model is kind of interesting when you consider moving the string anchor point "c" from the end of the body (tailpiece) to pins. I know nothing about this, but I've always thought the break angle was the angle of deviation of the strings as they pass over the saddle - which in your diagram would be 90 - Θ. In a flat top this would be equal to Φ, assuming the string plane over the fret board is parallel to the plane of the top. Also, I'd think that, with a radiused fret board and a flat tailpiece, the break angle of the central strings would be slightly greater than that of the edge strings. Which would be phi if the top were flat and extended parallel to the strings all the way to the nut. Neither which are true. If a 6 degree break angle is sufficient at the saddle, is it also sufficient at the nut? If so, then why are most guitars built with closer to a 12 degree angle at the nut? Also, why are flattop acoustic guitar bridges typically built with a much sharper string break angle over the saddle? I'm not arguing, just asking. Ken Parker builds with a 4 degree headstock angle, and close to that at the saddle. There is no need to have an excessive angle, if all else is good. It's the angle from the nut to the tuning post that actually counts, obviously, and again the only thing that matters is keeping the string from bouncing. Flat top bridges are a totally different mechanical thing than archtop or tailpiece parlor bridges, their angle is subject to very different analysis. I have always suspected that their bridge to pin relationship is more about keeping the strings in the holes with the pins than anything related to the bridge saddle. I have a perfectly setup 1962 Melody Maker with a wrap around bridge/tailpiece, and obviously it works fine with undeterminate break angle (string wraps around the bridge). Sorry to be away from this thread for so long. I'm a 'structural-functionalist'; if it works it's good. A 'bad' break angle is one that either is too low to keep the strings in contact, or so high that it causes unnecessary loads on the bridge and top that might lead to failures down the road. In my mind the break angle is the angle that the string breaks downward behind the saddle. In your digital gauge picture a reading of 180 degrees would be zero break angle. By my lights your 12 string is showing 3.2* of break, the red archtop has 11.6*, and the other 13.3*. Resos usually keep the strings in place by notching the saddle. Brian Evans pretty much nailed it; for some reason people think that more down bearing will transmit more force to the top and make more sound. In fact, it's easy to show that the vibration forces of the strings at the saddle are well defined, and depend on the initial displacement angle when the string is plucked. You'd have to work pretty hard to get that transverse force above 15% of the string tension, which implies that a break angle on the order of ten degrees would do it. Since the signal is limited, and will all be transmitted so long as the strings and saddle stay in contact, anything beyond that is simply trying to break the bridge or top. Freeman: is that one of Paul Norman's CF biscuits? Alan Carruth wrote: Freeman: is that one of Paul Norman's CF biscuits? Sharp eyes, Alan. Yes it it. Don't know if it made a difference since I changed both the cone and the biscuit at the same time but its pretty cool. I think of this as being analagous to the output tube in an amplifier. You have a fixed DC supply at the anode with the signal superimposed on it so it goes up and down. The output transformer passes only the Alternating signal not the DC component. The downward component which the soundboard receives is much the same, a static load and a variable up and down load from the string vibration. Sound is only produced by the latter. Besides excess downforce causing soundboard sinking, it also, at the design stage, means that the soundboard and it's bracing has to be made stiffer and thus less responsive.